Cycling Clubs rode in one of the last events organized by the Velo Quebec (Quebec Cycling)Association, as the Eastern Townships Challenge, a popular un-timed rally of 75 to 150 km wound it's way through central Knowlton and the hundreds of registered cyclists stoppped for lunch in the schoolyard before getting back in the saddle and heading back on their way to the finish line. The cool and rainy day might not have made for the ultimate tourist ride but the cyclists at the VolksWagon sponsored event who stopped under the church awnings during their lunch break were non-plussed by the rather torrential rains. Most cyclists are well prepared for anything be it a flat tire or a sudden drop in blood sugar so with news that a cold front and rain were going to be part of the Challenge they obviousely prepared. Cyclists are well-known for being able to ignore rain and snow in the persuit of a trip down an unknown bike trail or a high-speed sprint early in the morning. What many of us consider to be a strange obsession the avid cyclist finds to be a fundamental part of life. The dedicated cyclists are beyond those of us who simple own a bike for fun. Yes we may have a touring bike that we occasionaly tie on to our bike-racks and head to the Green Route for a leisurely ride to the local snack-bar with our newest pair of peddle-pumpers but the cyclists in many Canadian Cycling Clubs can be downright obsessive about owning the best bicycles and newest bike clothing available. 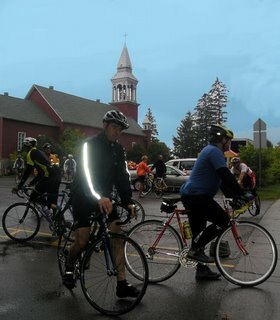 The notoriety of such events as the Tour De France and the Landis doping scandal shine a grey cast on the sport but the reality of many small towns and regions in Quebec and throughout Canada is that friendly bike clubs are popular amongst enthusiasts who just want to get togetehr for week-end rides and special touring events with fellow like minding cyclists in the area. Cycling is a popular sport with singles and joining a riding club is a great way for sportive singles to meet other cycling singles. Who knows...it's a long and winding road...even on a 12-speed aluminum racer!! The organizers of the event in Knowlton did a great job! The signage downtown was clear and helpful for all residents and ensured there were no accidents and the sponsors and organizers did a fantastic job all around. If only the weather had been better we would have seen more folks lining the sidewalks cheering just like they do during the Tour de France. If you ever wondered where to have a detailed listing of the Quebec Bike Trails and touring information then Velo Mag has recently published an amazing book for serious cyclists. The ultimate books for cyclists in the Eastern Townships includes trails and accomodations. Velo Quebec was established in 1967 and has been promoting and advocating on behalf of cyclists for almost 40 years, working to make the province of Québec more bike-friendly including being the major influential force in ensuring the adoption of Quebec's first cycling policy, the paving of shoulders, the development and maintenance of the bicycle network and other positive initiatives. They are instrumental in working towards the expansion of the Route Vert or Green Road for cyclists in the province. The Velo Quebec website has information on the local Cycling Clubs in the Eastern Townships including the Les Cyclones de Granby, La Grande Roue Magog-Orford, Club Velomanis and the Club Cycliste de Sherbrooke which are the closest active clubs to the Knowlton area. Serious cyclists or singles looking to meet other singles interested in outdoor activities will find their website crucial for details on events and members. Click here to visit the Velo Quebec Eastern Townships Cycling Clubs listed on their website.